It’s been 10 days since our last post and you’ve probably been wondering what’s happened to us! Well, we have been busy as beavers around here making lots of changes in the garden. It all started about a month ago when we made the decision to move our compost bin that you see here. 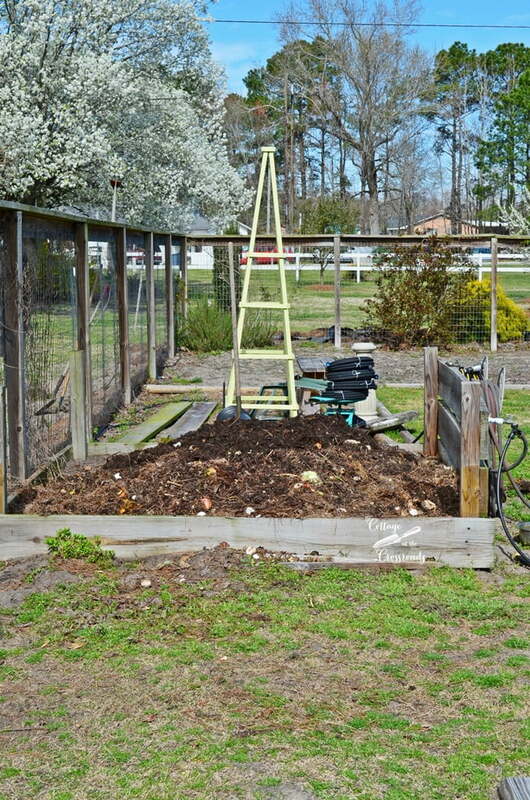 It was the first thing that anyone saw when entering our garden, and although a compost bin is a necessity when one is trying to garden as organically as possible, it is not always attractive. So Leo took down most of the wooden boards that contained it and proceeded to move the compost, shovelful by shovelful. 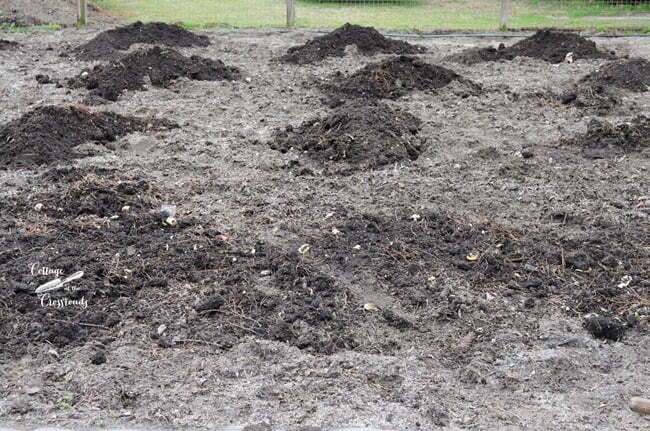 The process took a few days, and the piles of “black gold” ended up here in our tomato planting area. Our new compost bin has been moved to a more discrete place outside the garden. I usually like to post pretty photos but sometimes things have to get downright “messy” before they can get better. In addition to the compost bin moving, lots of other things were moving around, too! You can see in this photo that we left one wall of the compost bin standing because of the water lines there. Leo replaced one of the boards that had gotten warped from the weight of several hanging hoses, added a new post in the middle for additional support, and attached a new hose reel. I stained the boards with the same Cape Cod Gray Olympic stain that I used to stain our Outdoor Potting Bench and Fence Panels last year. Leo also moved some heavy pavers that we had placed in our outdoor eating area last year because, FOLKS, that is moving, too! Having the pavers under the hose and faucets should keep this spot a little tidier, especially after we add some small pebbles around them. 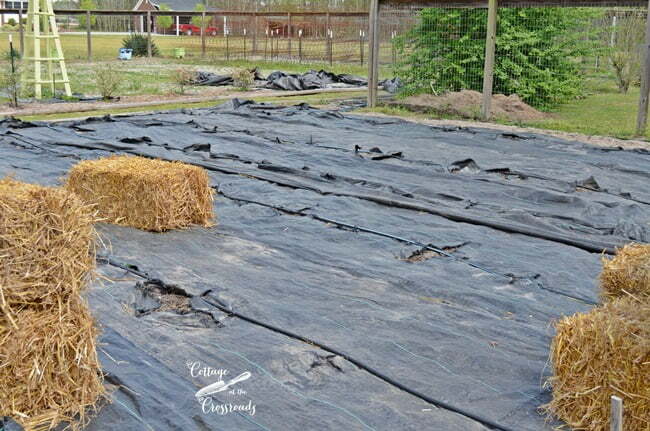 In the meantime, we prepared the tomato planting area by putting down landscaping fabric to control the weeds. 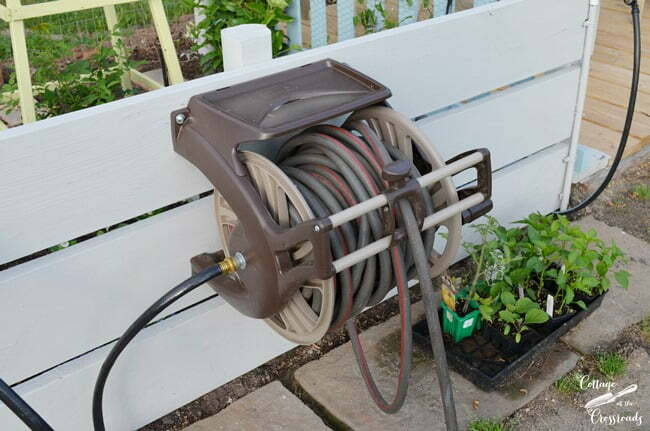 You can read more about this in our post How To Control the Weeds in Your Vegetable Garden. After the fall growing season, we rolled up the landscaping fabric and saved it to use this year. The planting holes were already cut and we ran the drip lines to the holes. And I’m happy to report that all the tomatoes and marigolds have been planted! 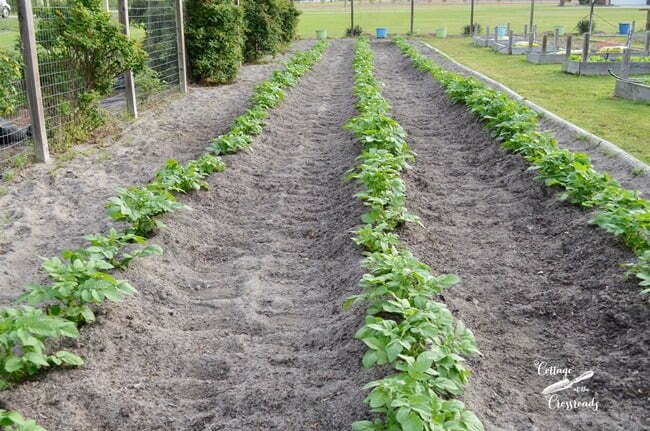 The potatoes that we planted in February are growing, and I’m eagerly anticipating the time that we can dig around the plants and steal a few “new” red potatoes! Those things you buy in the store taste nothing like the fresh ones! Where the old compost bin was is a new flower bed. 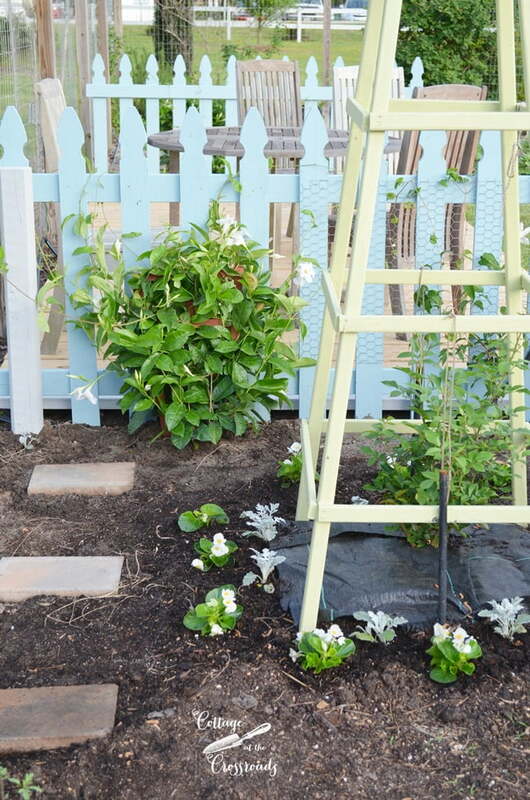 I planted a white climbing Iceberg rose bush under one of our DIY Wooden Garden Obelisk that Leo made last year. 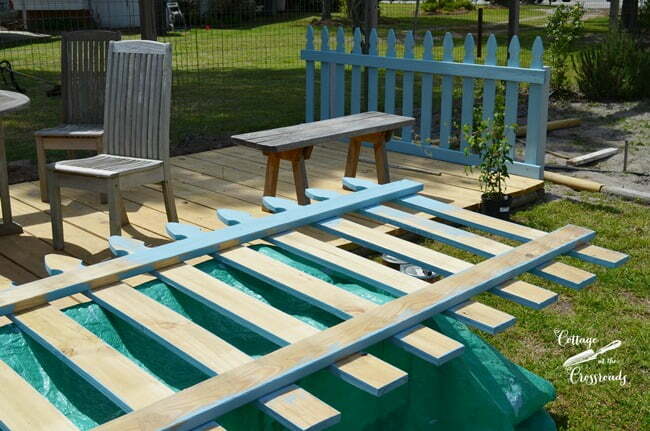 Somewhere along the line, we got the idea to add some picket fence panels to each end of a wooden deck that we built. 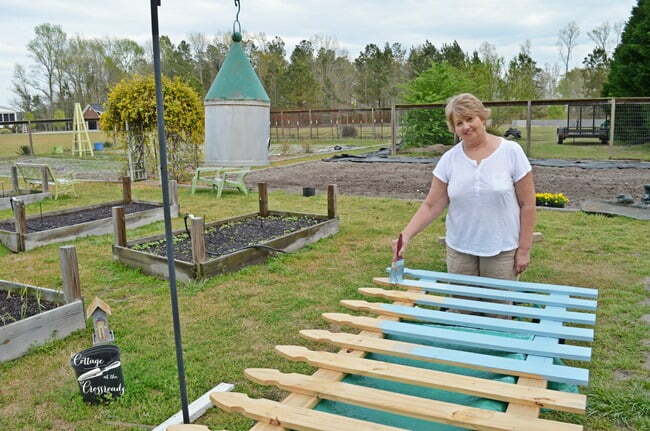 Here I am staining them with Olympic solid color stain in a beautiful blue color. 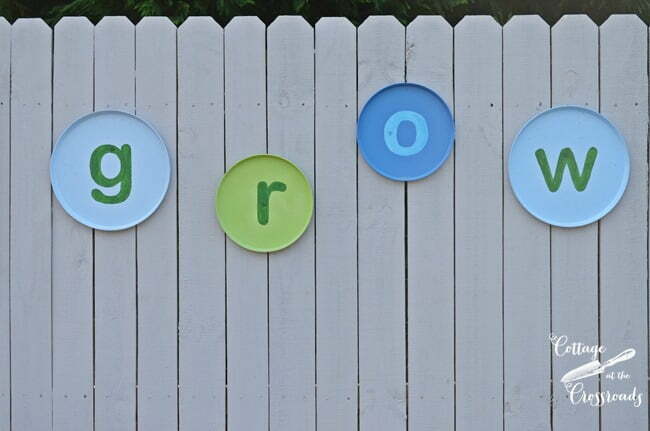 This may sound a little weird, but I have a blue, green, and gray color scheme going on in the garden! Here you can catch a glimpse of our new deck in the garden, and Leo will give us a full report soon on how we constructed it. 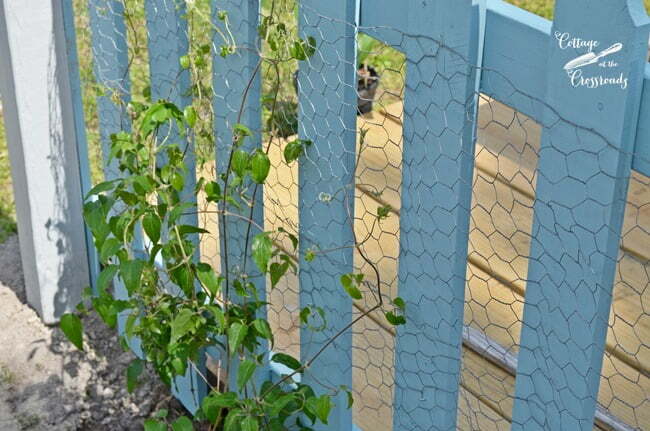 Once the panels were attached, Leo put up some chicken wire and we planted white clematis vines along them. When I bought the vines, they had a few buds. And this is one that has opened. 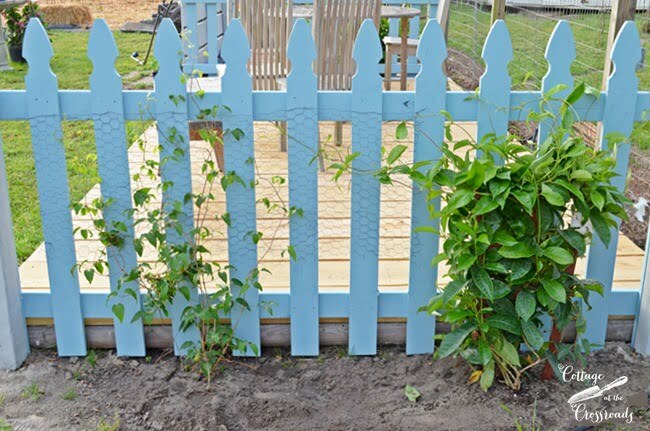 To make sure that we had something blooming all summer, we added two mandevilla vines to the fence panels. I just can’t wait to see the panels covered with white blooms, and I’ll be sure to post an update to show you! In the area that was previously the compost bin, I have added some pavers and flowers. I planted a blue perennial called lithodora along with some lobelia, begonias, and dusty miller to keep with the color scheme. 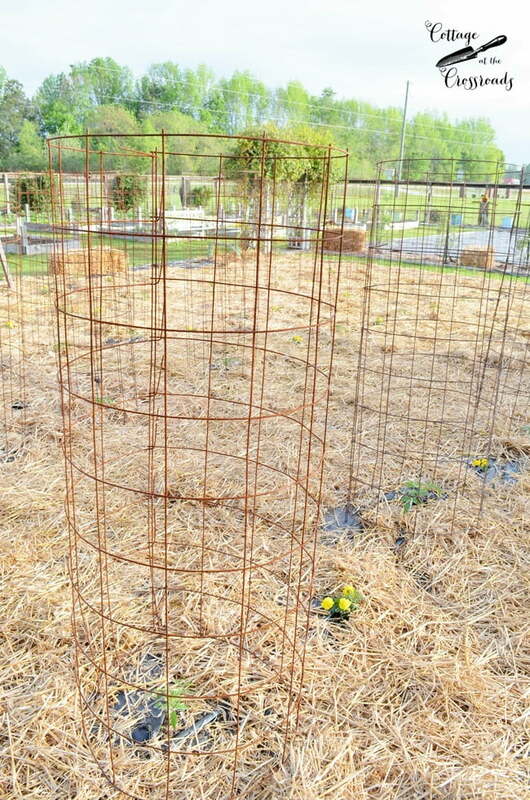 Since this photo was taken, I’ve added pine straw as a mulch, and I’ll be sure to post photos of how this area looks once the flowers start filling in. Near one end of the deck is this Chinese snowball viburnum bush that my sister-in-law Jean gave me last year as a birthday present. It was previously planted in the flower garden in front of our vegetable garden, but we moved it early this spring. Because, guess what, friends! We’re getting ready to start our biggest spring project in that area! 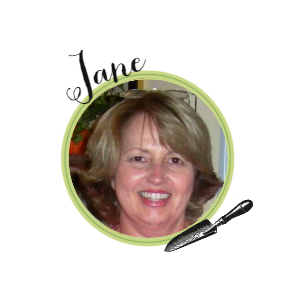 Hi Jane: I came over from Heather’s blog link party! Yes, I know, I’ve seen your name around… Wow, this is quite a lot of work!!! Amazing. 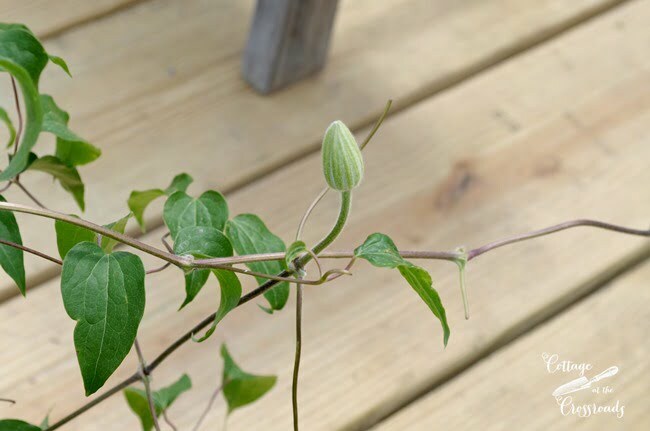 I love the vines on the new fence: clematis can be so tricky, I think. In our old house I tried a vine in a particular spot maybe 3-4 times. It just didn’t work, and of course, this then was over several years! Now, down here in N.C. I have a gorgeous blue vine that is doing very well. In a way, you just never know what is going to “take”, no matter what you do. Anyway, I’ll go subscribe now! It all looks fabulous! And its huge!! You must have a lot of produce as the summer goes on. And I love the blue colour scheme. It works so well against the green. 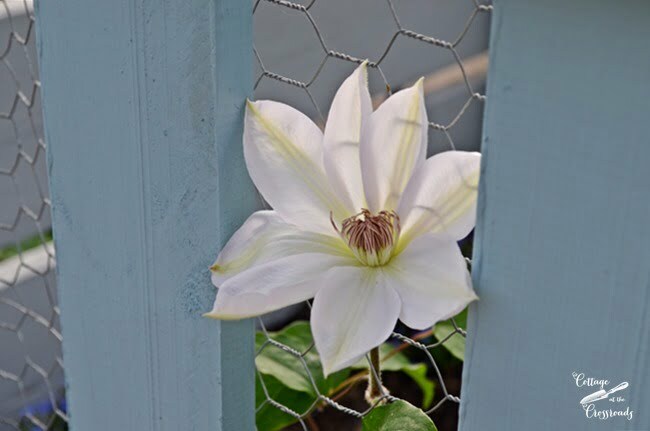 Thanks for linking up to What’s Blooming Thus Week Garden Party. I sure am glad I found your blog. I’m loving the posts about your garden and new deck. Sure wish I had paid more attention when my dad was living and gardening. Love your garden and always look forward to see what you’re up to this time of year! 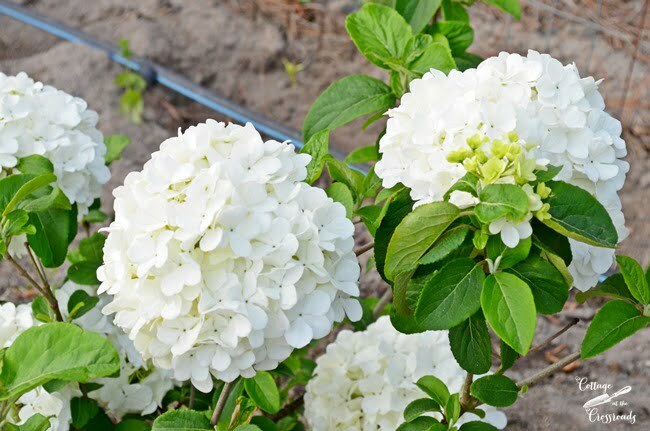 The snowball bush is one of my favorites. My mother’s is in full bloom and is just gorgeous!!! Now you have me motivated!!!! Hello Leo and Jane, I am new to your blog and have really enjoyed reading and seeing your pictures of your garden! I love your color scheme! My husband and I planted a small garden for the first time this year and are also renovating our home! Look forward to reading more of your blogs and being inspired! Thank You! I know your hard work always pays off as you two have the greatest gardens and I so look forward to seeing it grow each year…love the colors of your garden and the clematis looks wonderful against the blue..I am wanting to get a snowball viburnum .. so off to the Farmer’s Market soon!…Glad you are back! 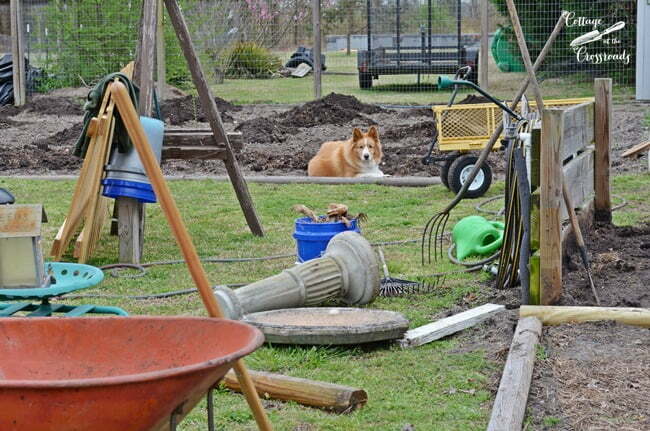 Jane and Leo, I love seeing the progress in your garden. 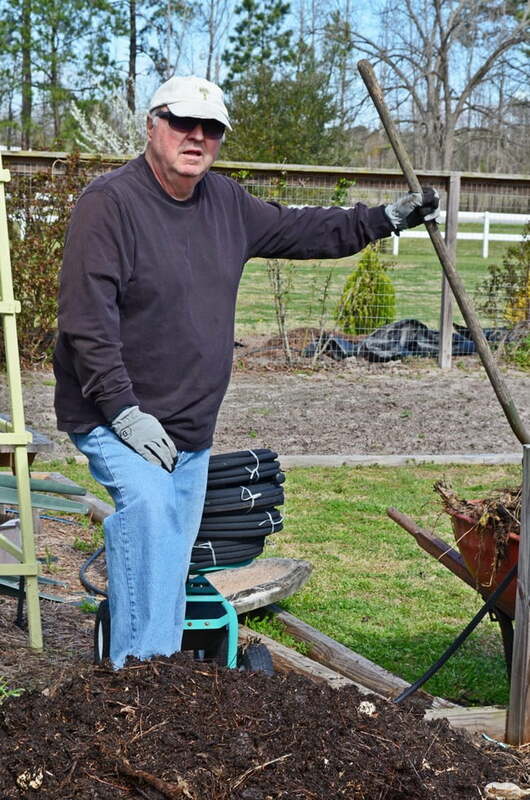 I know what you mean about moving the compost pile. We have garbage cans with holes in the that we make a little compost, but I’d love to have one of the tumbler types. We don’t have a good sunny spot for a big compost bin. Love the colors you use in your garden, too. Thanks for the garden inspiration. We still have about 3 weeks until our last frost date passes, but I’ve been out cleaning up and prepping the flower gardens already. I love this time of year, and I enjoyed reading about what you are doing in your garden! 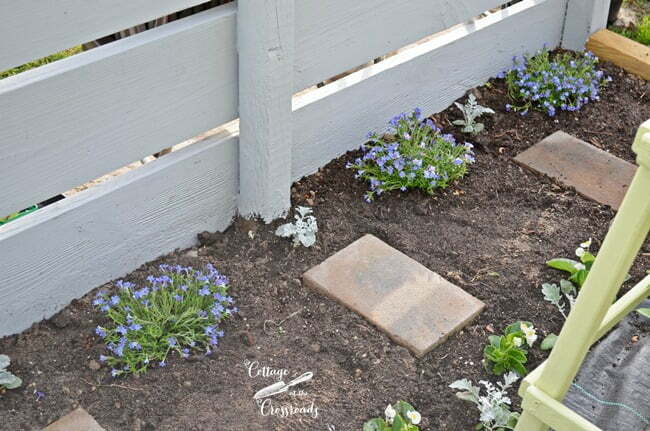 The blue fence is lovely! Can’t wait to see more! We had 5 inches of snow yesterday and the day before. Leo and Jane look very inviting. Without a doubt this will be amazing! The kind of work you are showing here is my favorite! I love to work hard and get dirty. The outcome is so worth it. You two have been really busy and it all looks great. Wow! You are little beavers! Love the changes, the blue pickets and the new flowers! Can’t wait to see the other changes you are working on. Y’all are busy busy, Jane. Lots of hard work, but you will have such nice fresh veggies. Look at those potatoes go! I need to tell hubby it’s time to plant tomato plants. Last year he got lazy and didn’t plant anything. The color scheme is perfect! What a nice garden. Oh my you have been busy and it’s turning out just grand. I so love your garden and all the great ideas. Oh my gosh I love these posts! What the two of you accomplish in your garden blows me away. What a wonderful thing to do together. Excellent choice on the clematis too. Can’t wait to see what is next! 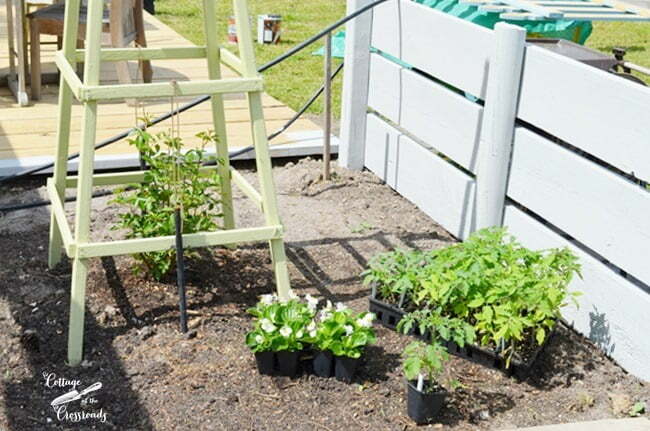 WOW Jane you guys have been busy bees…I can’t wait to see how your garden looks in about a month!! Nothing beats garden veggies! Wow! Y’all have been really busy! I can’t wait to see the garden once it has filled out again! Oh wow!!! Jane and Leo, you two amaze me. 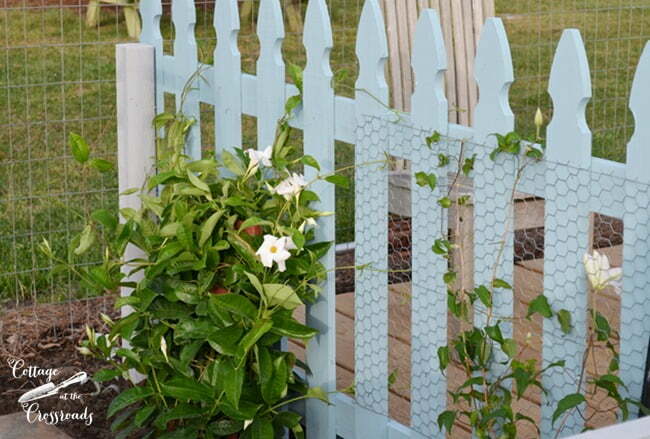 How beautiful … Luv the blue picket fence and the flowering vines climbing up. We plan on redoing our back harden this year. NO where near the extent and beauty you have … hahahaha.. but its in need of help. Wow, You two have really been working so hard! I love everything you are doing! The color scheme is wonderful! I pity Leo’s back all of the shoveling and moving but like you say that is black gold! I really like seeing the colored picket fence. Such a welcome change from typical white you tend to see everywhere. The white Mandevilla vines will be fabulous crawling over it! . Keep up the good work Leo!